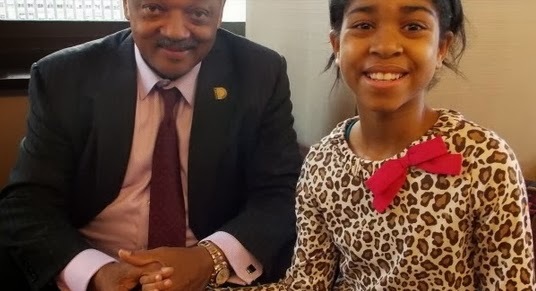 Talented Nigerian girl, Zuriel Oduwole has added American Civil Rights activist, Reverend Jesse Jackson to the list of world top leaders she has interviewed in the past. 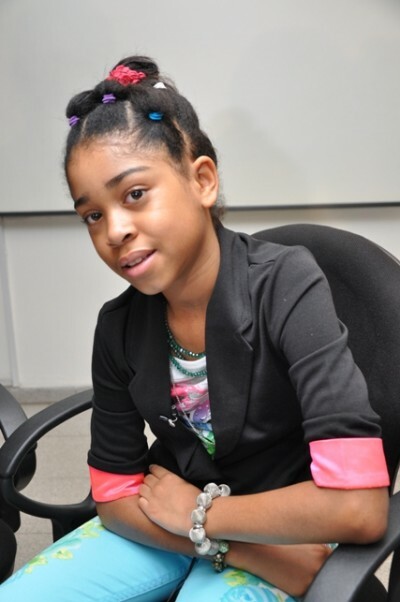 Last Thursday, Oduwole, who is youngest person to be interviewed for a feature by Forbes magazine when she was 10 sat for a camera interview with Rev Jackson at the Annual Clinton Global Initiative in New York. Jackson, who was with the reverend Martin Luther King Jr till his last seconds before he was assassinated in Memphis – Tennessee in 1968, gave a no holds barred interview to Zuriel on Thursday September 26th, discussing topics including what it meant to him when Barack Obama, a Kenyan, became the 44th President of the United States. He also spoke on what it was like to be the first African American to mount a serious run for the White House, in 1984. Zuriel had before now interviewed leading African personalities, including eight African Presidents, Africa’s richest person Aliko Dangote and tennis super stars – Venus and Serena Williams. She was welcomed to Malawi on Wednesday, October 2 by the US Ambassador, Jeanine Jackson and the Public Affairs officer, Gabriel Hons-Olivier. Ambassador Jackson described Zuriel as a true Ambassador of Mutual Friendship, who has done an incredible job as a global citizen to bring a fresh perspective on the need to educate the African Girl Child. Zuriel visited several schools, including the Bishop McKenzie School, Dzuka Girls High School, and the largest school in Africa for AIDS related Orphans – Jacaranda School. She interviewed the schools founder; Marie Da Silva, a CNN Hero winner in 2008, on the challenges of delivering on the promise of the schools free education for the Orphans, in a tough environment like Malawi. Zuriel capped off her stay with a visit to a radio station, where she spoke to students and their parents on the value of early education, and the need to keep the Girl Child in school. She has since left Malawi for Tanzania, another East African country in the next stop of her program tour. Zuriel has interviewed eight current African Presidents and two former African Presidents, covering a wide variety of topics from the UN Millennium Development Goals, to the Education of Africa’s children. They include the current Presidents of Liberia, Kenya, Cape Verde, South Sudan, Mauritius, Tanzania, Malawi, and Nigeria. She also recently interviewed a select few high power delegate in New York to the just concluded Clinton Global Initiatives, including the Rev Jesse Jackson, and the Denmark delegation to the UN, on DANIDA’s activities in Africa. She is scheduled to start meeting with leaders in Jamaica later in October. This interview was conducted at the Protea Courtyard hotel in Dar es salaam October 6, 2013. Apologies for the noise in the background, courtesy of her two young sisters and brother with kids of the interviewer who were so excited to getting to meet each other and just would not stay put for a second. If she wasn’t born in Nigeria why call her a Nigerian in the first place. This girl is simply amazing. I Googled her and saw all the incredible things she is doing. She is making Nigeria proud. Barack Obama is Kenyan as far as we are all concerned, so this Girl is Nigerian, not because her dad is Nigerian and her mother is also from Africa, but because she spends many months in Africa, doing what she is doing for Africa’s Children year. Well done. You make the country proud.